Well I don't think you can do better for the money. The only down side of such a speaker it really magnifys the quality of recording you're listening to. I've listened to recordings I've had since the 70' and heard subtleties never heard before. I have a new love for listening. A good bump around the top might topple them. These speakers have been on my watch list since they came out a few years ago. At $3,000 a pair they’ve been a bit out of my price range. When a recent sale from Polk presented itself, I snapped up a pair! I hope they are of good quality as they aren’t inexpensive. This is an area that Polk has really outdone itself. These speakers look like hand built custom speakers. Believe me, the pictures do not do them justice. All of the hardware used is top quality. The veneer is flawless and looks painted on. All joints are barely even visible. There are no parallel surfaces in these cabinets and I doubt they are cheap to produce. The grills are held on with hidden magnets. The speakers therefore look great with or without the grills installed. This is a really neat feature. I know that some other high end speakers use this method, but I’ve never owned any and it really works great. The binding posts and plate are higher quality than any I’ve seen on a Polk before. In some other reviews, positive comments have been made about the use of jump wires versus jump bars on the binding posts. This is a step in the right direction. However, I feel the wires and connectors used are slightly cheesy and not up to the overall quality of the rest of the speaker. I replaced mine with some better ones I had laying around. In order to level the speaker, the spikes/feet are adjustable from the top, which is a very convenient feature. The speakers are adjustable where they stand. There’s no need to tilt the speakers to get under them to make adjustments. The adjustment hardware is of high quality and gives the speaker an expensive high tech look. Too bad this area will be modified on my pair to accept the new outriggers I have ordered. It’s pretty dumb to have a speaker this top heavy with such narrow feet. This is one of the very few flaws of these speakers. In my opinion the color on the Mahogany models is way too dark. These speakers might as well be black paint. In fact everybody whose seen these so far believes they are black, until I shine a flashlight directly on them. Only then can you barely see these are VERY dark brown. And mine are directly in front of a window! The veneer is also sanded down too smooth IMHO. None of the grain of the wood is visible. Why use real veneer if you can’t even discern it’s authenticity? In his Model 7, Richard Vandersteen claims to have produced the world’s first “truly pistonic” drivers, with cones so stiff that they can’t breakup. I can’t speak to that claim, but the model 7 is the best imaging speaker I’ve personally heard. The imaging and clarity of these 705’s approaches that of the Vandersteen Model 7 and easily bests the Model 3 in my opinion. The “aerated polypropylene” cones are said by Polk to provide for a very lightweight and very stiff driver. I believe them. 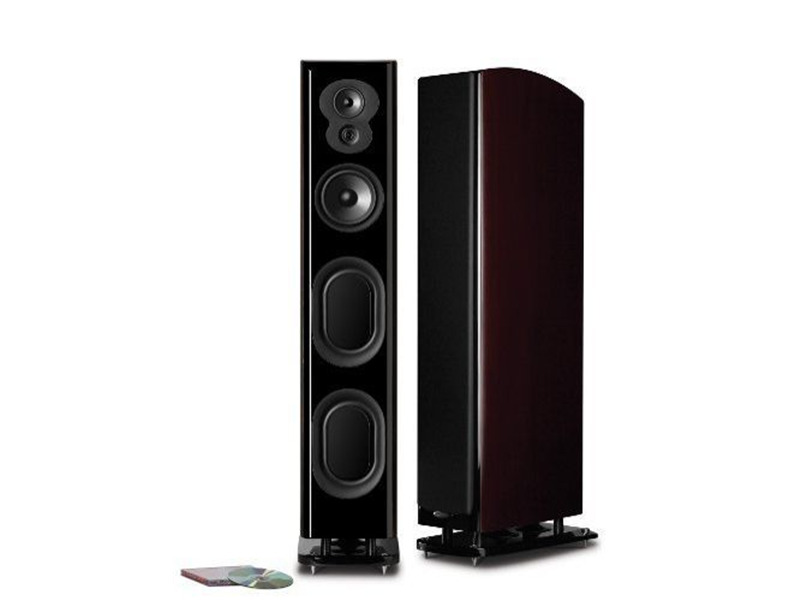 I really can’t say enough concerning the accuracy and precision and clarity of these loudspeakers. Polk has really done their homework on the design. And unlike other highly accurate speakers such as Thiel and Vandersteen, these speakers aren’t bashful. Throw on some Led Zeppelin or Rush, turn up the volume, and they’ll provide an instant party. They have a bigger soundstage than the LSi model Polks and much bigger than the previously mentioned brands. Lots of audio enthusiasts are aware of the phenomenon of better speakers being less forgiving of poorer recordings. The LSiM705s display this characteristic to an extent. The 705s can sound a little cold when asked to reproduce bad material. This is an unfortunate aspect of hyper accurate speakers. This pair seems to be doing less of this as they get broken in. For me these speakers are Keepers. Big time.